I'll admit it, when it comes to music I'm a particular brand of pretentious. If it was written before 1949, or is played inside hole-in-the-wall cafés with drawings of Audrey Hepburn on the wall, then I'll probably love it. 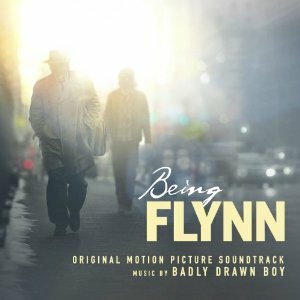 That being said, the opening notes of Being Flynn - Original Motion Picture Soundtrack told me that I was in for a treat. However, those clean, simple, and vaguely intimate acoustic notes only hinted at the eclectic and unconventional journey ahead. 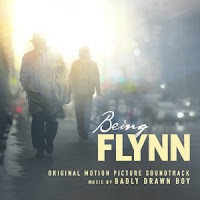 Being Flynn, starring Robert De Niro and Paul Dano, reunites writer/director Paul Weitz with Damon Gough, better known as British singer/songwriter Badly Drawn Boy. The two first collaborated for Wietz's 2002 film About a Boy, and this latest project reaffirms that this paring is a good one. This isn't only because the soundtrack provides the film with humanity and soul, but also that it stands on it's own as a musical achievement. It is more than just a beautiful movie soundtrack, it is also a great album. The strength of the soundtrack lies entirely in the hands of Gough's unique talent and sound. Those familiar with his other works will feel right at home here. The album is heavily string driven with deep and mournful vocals that often play contrast to often upbeat melodies. Each track dances delightfully between this contrast, and still manages to bring to the table a different sound and style. The array of different sounds each track displays is partially what makes the album such an interesting listen. While some tracks pull heavily from their sensitive singer/songwriter motif, with piano and acoustic guitar leading the way, others toss in violins, saxophones, and in at least one case an electronic drum machine. For the most part this hodgepodge of instrumental voices works quite well with only one notable exception. The mid album track "Priest" dives head first into a full orchestral score that swiftly builds into a disjointed mess that only serves to be entirely unsettling. It is unclear why this track was included on the soundtrack album. On the plus side, the offending track is little over a minute long and is typically finished by the time I manage to find the skip button. This single minute long blemish aside, the album is indeed a treat. It can be enjoyed either for the emotional impact it lends to the film, or as an example of the musical talents of Damon Gough. Either way, for those who enjoy music with a little soulful punch hiding alongside upbeat melodies, there is more than enough here to satisfy.